Photos do not do justice to this place. Perched on top of an island of volcanic rock this ancient town is steeped in history. 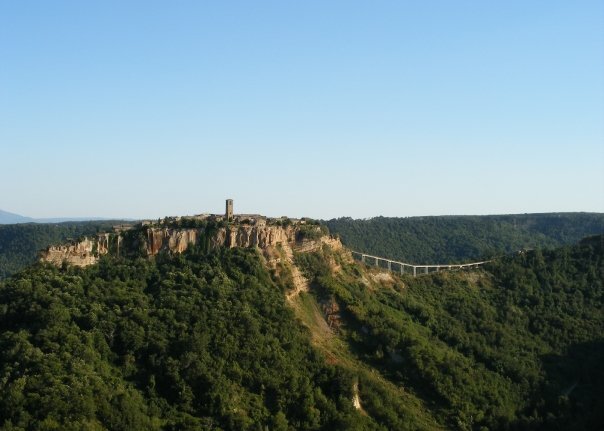 Once connected to the neighbouring village of Bagnoregio, the land has long since crumbled away and this unique site, founded by Etruscans over 2,500 years ago, can now only be accessed by footbridge. The town has become known as “il paese che muore” or “the dying town” due to its dwindling population and the ever present threat of further erosion. It does however remain a popular tourist attraction and the residents pride themselves in keeping the town spotlessly clean and tidy and readily welcome visitors. 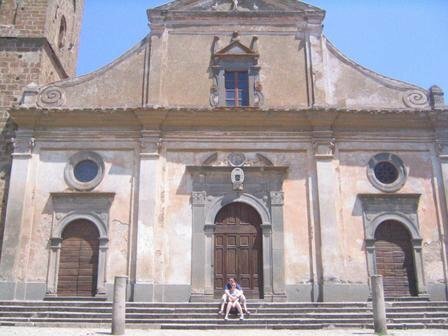 Eat – Hostaria la Cantina – Set in the heart of the old Etruscan town to the right of the church. This little restaurant serves traditional home cooked food at a reasonable price. For a meal with a view try Hostaria del Ponte. Courteous service and excellent food that will only outdone by the view, particularly at sunset. Stay – Alma Civita is a recently restored restaurant with rooms and in the centre of the ancient town, it does super food too, but for a true taste of local living stay at Civita B&B. A tiny 3 bedroom bed and breakfast, with all bedrooms facing onto the picturesque main square and double rooms from just €70.